Top-rated for its tasty free breakfast the non-smoking La Quinta Inn & Suites Helena knows that fresh-baked cookies and milk at bedtime provide a great way to win over almost any our guest. The three-story hotel provides 74 non-smoking rooms featuring plush bedding with pillowtop mattresses. But don't hunker down for the night before visiting the lobby for those fresh-from-the-oven cookies compliments of La Quinta. Get cozy in front of the 37-inch flat-panel TV and rev up the remote or opt for some web surfing with in-room Wi-Fi. Come morning head for the complimentary breakfast of scrambled eggs and bacon biscuits and gravy hot and cold cereal and more. If you live it up too much you can burn it off in the exercise room. There's a business center for folks who need some computer time and a coin laundry should that need arise. Pets are permitted with an additional fee. 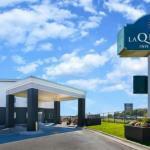 Just off I-15 La Quinta Inn is less than a mile from the state Capitol and less than two miles from the Holter Museum of Art Reeder's Alley and Carroll College. Canyon Ferry Lake and Gates of the Mountains are 18 miles away and it's 32 miles to the Great Divide Ski Area. Helena Regional Airport is three miles from the hotel; it's 85 miles from Great Falls International Airport.